According to the official history of the navy medical department in World War II(1), in early stages of the war in the Pacific, LSTs(2) carried one medical officer and equipment for emergency surgery. Experience quickly demonstrated that when these small ships took on casualties for evacuation to larger hospitals or hospital ships, the medical staffs were simply inadequate to provide necessary care for the 100 – 200 casualties typically taken aboard. And, given that the time it took to get casualties to definitive care under these conditions often exceeded 24 or even 48 hours, it became clear that facilities for major surgery closer to the area of combat were a necessity. While the small ships (not LSTs in this case) accompanying the landing forces at Arawe, New Britain in December 1943, for instance, carried surgical teams of 2 surgeons and 10 corpsmen, the care these teams could provide was not sufficient to the need. Around this time, LSTs converted specifically to accommodate casualty care and manned with surgical teams came into being, and they participated in the Cape Gloucester (at the northwest end of New Britain) invasion on 26 December 1943. As operations continued in the Bismark / Solomon Sea areas, the need for a forward-deployed ship capable of providing definitive, specialized surgical casualty care became urgent. LST 464, the first and only LST converted into a hospital ship, served that need. Work done in Sydney Australia fitted out its tank deck with an operating room, offices, laboratory, a radiology room, and an isolation ward. 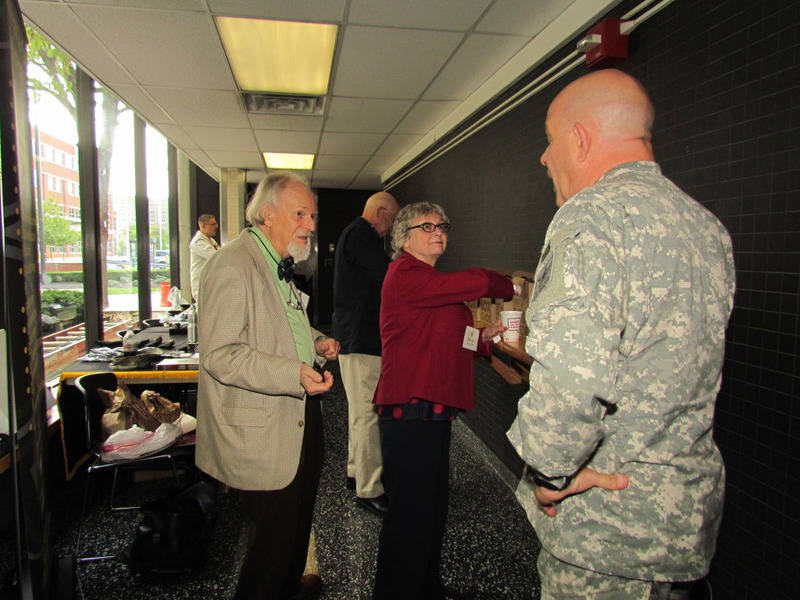 Its staff included a surgeon, internist, dermatologist, urologist, EENT specialist and supporting hospital corps officers and corpsmen. Additional surgeons were ordered aboard on an as-needed basis, and an anesthesiologist and psychiatrist were added later. Thus staffed, LST 464 supported early operations like Lae, Arawe and Cape Gloucester from advance bases at Cape Sudest, Morobe or Buna, where she received casualties from amphibious craft and transported them to Milne Bay, some 350 miles distant. After Humboldt Bay (now known as Yos Sudarso Bay, on the north central coast of Papua-New Guinea) was taken in April 1944, the ship moved there to serve as a base hospital to support construction battalions and other troops locally. In preparation for the invasion of Leyte, a blood bank (3) was established in LST 464. Its director was LT Ernest E Muirhead, MC, USNR, a physician experienced in blood bank operation. LT Muirhead had previously demonstrated the feasibility of such an operation when he prepared blood on another LST and carried it ashore to aid casualties in the Noemfoor Island landings of July 1944. The ship proved to be of particular value in the Leyte landings because she remained close-in, unlike the much actual hospital ships, which proved to be tempting targets for kamikaze pilots then being thrown into battle. LST 464 remained in the Leyte gulf as a station hospital until March 1945, when she transited to Subic Bay in the Philippines, to serve the same role. 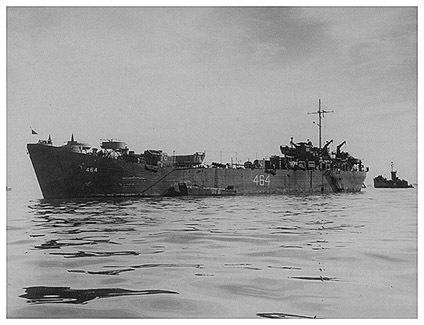 At the end of the war, she was redesignated LST(H)-464. She served for a short time in Korea after the cessation of hostilities. (1) NAVMED P-5031, The History of the Medical Department of the United States Navy in world War II – A narrative and Pictorial Volume (Volume 1), Washington, United States Printing Office, 1953. P 184, 187-188. (2) LSTs (Landing Ship, Tank) fitted out for casualty care carried their usual armament and therefore did not enjoy the “protection” of the Geneva Conventions, which appear to have been largely ignored by the Japanese in any case. LST-464 was laid down in October 1942, launched in November, and commissioned in February 1943. After her conversion to a hospital ship function later that year, she was distinguished only by the six foot high white “464” painted on her hull amidships (http://en.wikipedia.org/wiki/LSTH, accessed 15 Sept 2012). (3) Kendrick, Brigadier General Douglas R, “Blood Program in World War II”, Washington, Office of the Surgeon General, Department of the Army, 1964. Pp 594-595, 616-618, 620. Up until the beginning of World War II, the use of whole blood transfusion for combat casualties was very much a primitive, often ad hoc undertaking. Blood was usually collected on a direct “as needed” basis, a cumbersome procedure which quickly broke down under combat conditions. Two practical problems and one conceptual problem had to be solved before large scale use of blood for combat casualties would be instituted. The practical problems were those of transfusion reactions – solved by the application of knowledge of blood grouping and the Rh “factor”; and storage or “banking” of blood solved by the used of anticoagulant-preservative solutions and refrigeration. The conceptual problem was the recognition that hemorrhage was actually the cause of shock in trauma, and that blood replacement rather than volume replacement was necessary for successful resuscitation of shock patients in preparation for surgery. 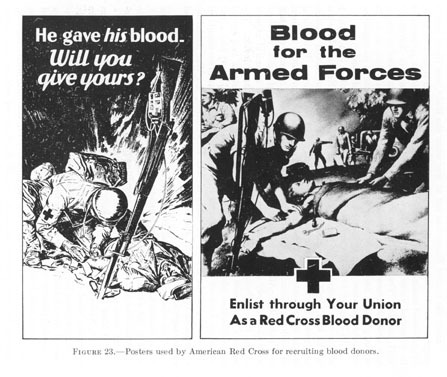 Early in the War, the U S blood program, organized mostly by the Army, in coordination with the American Red Cross, focused on the collection blood for its non-cellular fractions – plasma. 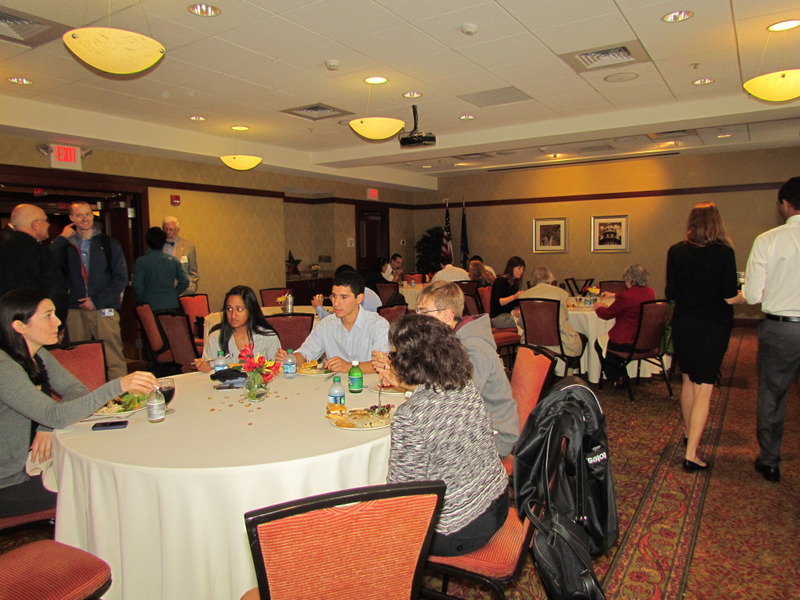 It was a very successful program. For the month of June 1944, for example, the American Red Cross reported that its 33 major processing centers throughout the nation had collected more than half a million units of blood. Most of this blood was processed to produce dried plasma, which could be reconstituted in the field. This procedure reduced weight and volume (important when logistical space was limited and need for combat materiel was great), and avoided the problem of degradation of the fluids by heat and time. It wasn’t until late 1944 that Army medical officials accepted the notion that plasma alone was an inadequate medium for resuscitating shock patients, and that oxygen carrying capacity – red blood cells – was critical to survival in emergency surgery and for post-operative recovery. 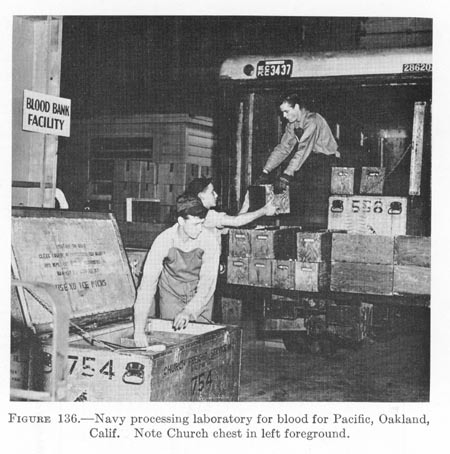 The Army began shipments of whole blood from the US to Europe in only in August 1944. In the Pacific area, initial supplies of blood came from the Red Cross blood bank in New South Wales, Australia, where studies on blood storage had resulted in the use of the preservation medium – dihydric sodium citrate-glucose solution (“ACD”*) – recommended by the British Medical Research Council – and the use of heavily insulated wooden boxes fitted out to hold 10 1-liter bottles and 56 lbs of ice, suitable for transporting whole blood, at 4.5 – 8 degrees C, by air. This system was worked out and functioning for Australian troops as early as December 1942. By August 1943, U S forces in the southwest Pacific area were receiving blood from Australian sources, transported by air and sea. In June 1944, Captain Lloyd R Newhouser, MC, USN, the director of the Navy’s blood program, was ordered to the Pacific to evaluate the need for, and means of supplying whole blood and blood products to the Pacific area. Early on, Captain Newhouser and his Army colleague Colonel Douglas B Kendrick, MC put their emphasis on procurement of blood locally, first in Australia, and then in Hawai’i. However, these sources were simply inadequate to the need. And with the high rate of malaria then prevalent among troops in the Southwest Pacific Area of Operations, surgeons became reluctant to use locally obtained blood. In October, Army Brig. 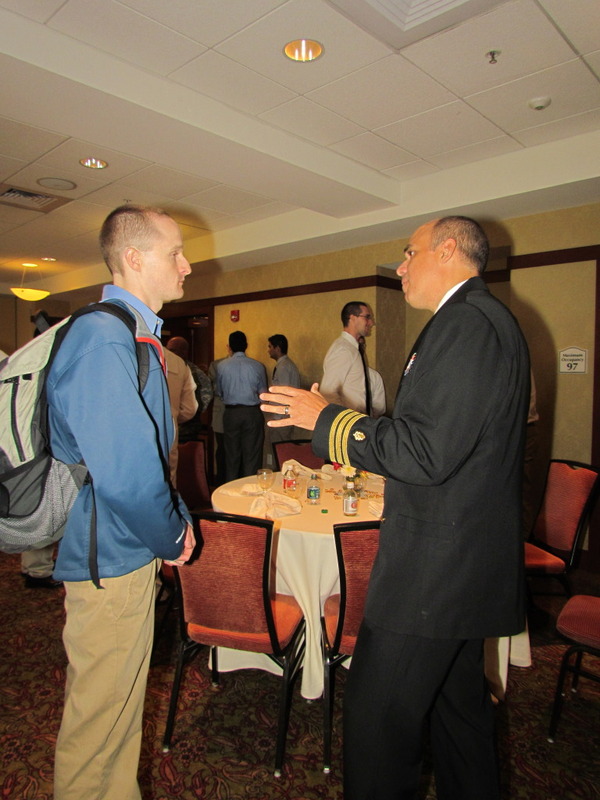 Gen Fred Rankin (Chief Surgical Consultant to the Army Surgeon General) and Captain Newhouser agreed that the Navy should establish a processing laboratory in California. The Army would provide all necessary equipment. Red Cross collection centers in Los Angeles, San Francisco and Oakland initially provided blood for the Pacific airlift; as the need for blood increased, the Red Cross added centers in Portland, OR and San Diego to the supply chain. Chicago went on line for the Pacific in January 1945, and after the end of hostilities in Europe, whole blood for the Pacific began to flow from New York, Boston, Philadelphia, Washington and Brooklyn. The Navy’s processing center actually ended up in Oakland. The first air shipment of blood left San Francisco on 16 November 1944. Between December 1944 and September 1945, 88,728 units of blood were shipped by air from the US to the Pacific. Shipments varied from none in a day to up to 12,000 pints shipped in one week, in May 1945. Blood flown from Oakland would be inspected and re-iced at Pearl Harbor after a 12 hour flight. It then went by air to Guam, from where it could be distributed to points of need throughout the western Pacific. While the actual flight time for blood was about 48 hours, when transport and flight stopovers are taken into consideration, most blood arriving at, say, Leyte, was up to five days old. There is little doubt that the Navy’s blood air transport program saved thousands of lives. 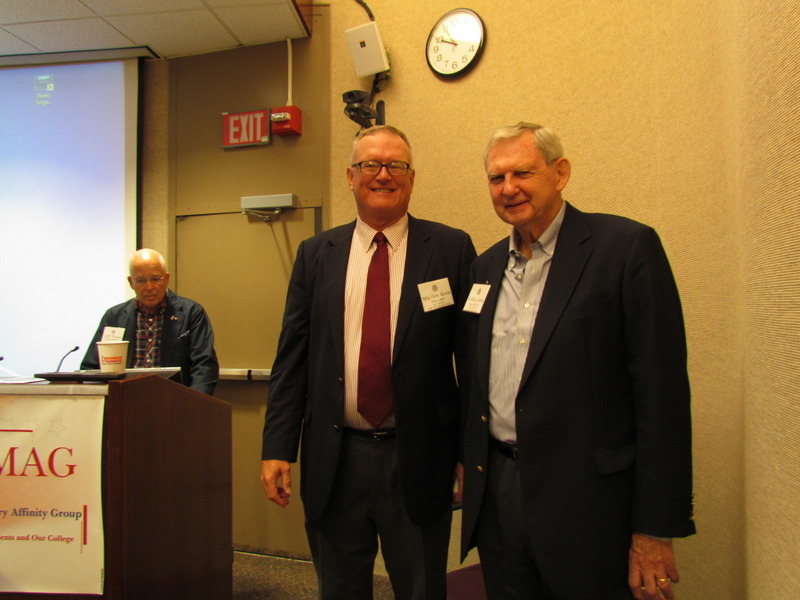 One Army field surgeon in the Pacific estimated that the mortality rate from abdominal wounds dropped 20% when whole blood, penicillin and oxygen therapy became available. Surgeons in the 119th Station Hospital noted that plasma was of little value for casualties received for care; their conclusion: “Blood is what is needed.” By the end of the war in the Pacific, the ratio of blood use was 1.5 units for every soldier or Marine in action. This from early in the war, when high U S medical officials denied the need for any red cells at all. * The Army blood program used a preservative called Alsevers Solution. While adequate for the purpose – refrigerated whole blood preserved with it could be safely used for up to 16 days after collection – it had the disadvantage of requiring 500 ml of solution for every 500 ml of whole blood. “Volume’ was an issue when considering valuable shipping space aboard aircraft carrying military supplies to Europe. The Navy’s choice of ACD, which preserved refrigerated whole blood for at least 21 days, had the additional advantage of much reduced volume of preservative (initially, 4:1 blood to preservative volume, later reduced to 6:1). From the beginning, the Navy used ACD for blood shipped to the Pacific. The Army switched over to ACD for shipments of blood to Europe in April 1945.